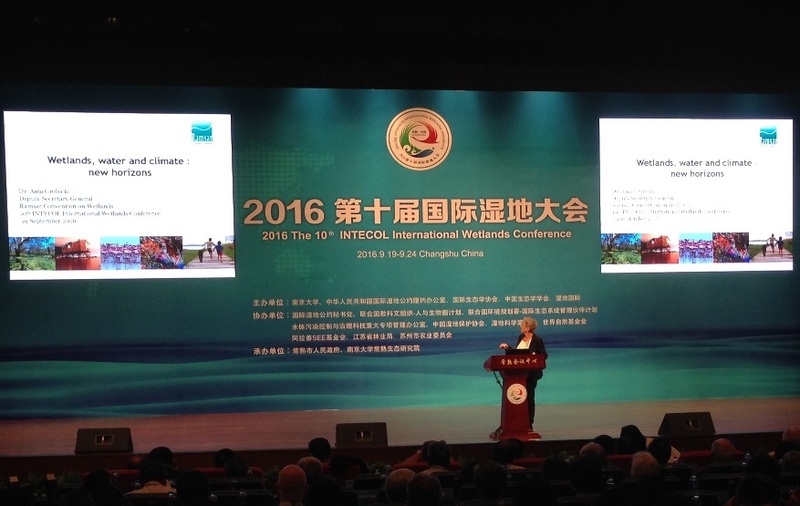 The Wetlands Working Group of the International Association for Ecology (INTECOL) holds their conference every four years and the latest, was held in the city of Changshu (China) from 19 to 24 September 2016. The conference brought together around 800 people, including the Ramsar Deputy Secretary General (Dr. Ania Grobicki), Scientific and Technical Support Officer (Marcela Bonells) and the Senior Regional Advisor for Asia-Oceania (Lew Young). Dr. Grobicki participated in the organizing committee as well as the scientific committee of the conference and she gave the opening plenary address on the theme of ‘Wetlands, water and climate’ (link to speech). She was also invited to speak on a panel organized by the Chinese hosts, to talk about the Ramsar Wetland City accreditation process, in a session entitled (“Wetlands and Eco-civilization practices”). While Changshu City may be a good candidate, due to the extensive wetland restoration projects taking place in and around the city in the surrounding rural areas, the Chinese government has a list of a number of possible wetland cities, and they will have an internal process to decide which cities to put forward for the 2018 accreditation by Ramsar at COP13. The panel discussion was followed by a press conference and several press interviews. At the request of the organizing committee, Dr Grobicki also co-ordinated the drafting and development of the Changshu Declaration. This declaration was formally accepted and signed during the closing ceremony. Members of the Ramsar Scientific and Technical Review Panel (STRP) also met during INTECOL (20-23 September) to develop the State of the World’s Wetlands and their Services to People report (SoWWS), which is one of the highest priority tasks in the STRP work plan for the 2016-2018 work cycle. Participants included: appointed STRP experts; representatives from the International Organization Partners and representatives from STRP Invited Observer Organizations, as well as other wetland experts. INTECOL offered an invaluable opportunity to gather expertise and relevant information to inform the development of the report. The main outcome of the STRP drafting workshop at INTECOL was a preliminary draft and a list of reference. During the conference, the Ramsar Secretariat presented in a number of workshop sessions and together with the Hanns Seidel Foundation, co-convened a workshop session on the conservation and wise use of wetlands in North-east Asia with a focus on the inter-tidal wetlands of the Yellow/West Sea. 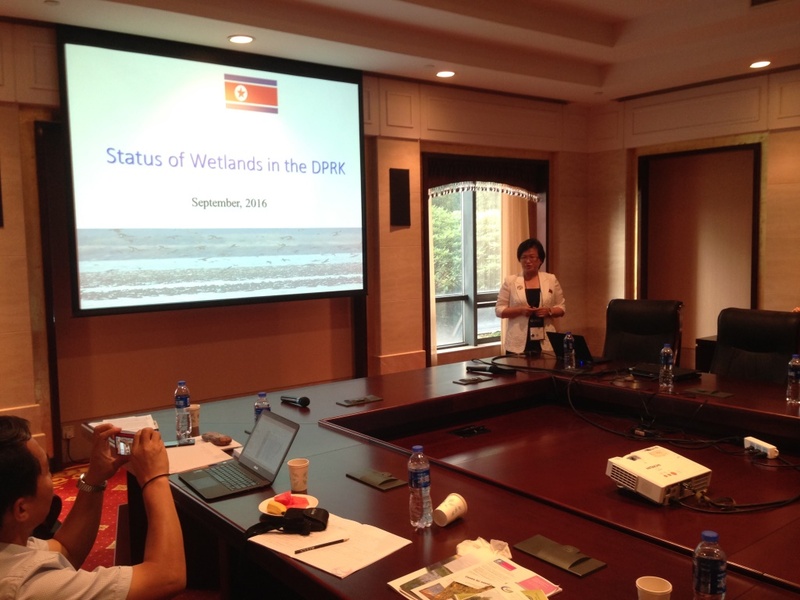 This was one of the first times that representatives from China, DPR Korea, RO Korea, and environmental organizations sat together to discuss the importance and status of the Yellow/West Sea tidal-flats, and explore opportunities for future cooperation of this declining ecosystem.